Sick building syndrome (SBS), or sick house syndrome, consist of various nonspecific symptoms that occupants of indoor areas experience. Symptoms of SBS include headaches, dizziness, chronic fatigue, nausea, irritation (of eye, nose, throat, or skin), difficulty concentrating, sensitivity to odors, allergies, cold, flu-like symptoms, increased incidence of asthma attacks and personality changes. Angela Cummings was a stranger who emailed me years ago. She reached out as a fan of my work, expressing interest in writing for me. I was very intrigued that she had discovered that her home had made her and her son sick. Having read about symptoms associated with toxic exposures from what makes up our homes and the things we buy for them, I was excited to talk to someone who had personal experience with this, especially because Angela was able to empower herself to recover and heal. Having met people of all ages who suffer from various chronic symptoms, I suspect that considering the health of our homes could help many. Most people just don't know that their homes and household items can contribute to health issues. For Angela, conditions she experienced included sinus and ear infections, itchy feet after walking barefoot on her carpet, swollen feet after walking barefoot on newly installed composite wood floors, feeling sick after using her wood-burning fireplace, and feeling not well after painting walls. Other symptoms that Angela had? In this podcast, you'll hear Angela say, "I had a lot of symptoms, I just didn't understand what the cause of the problem was." 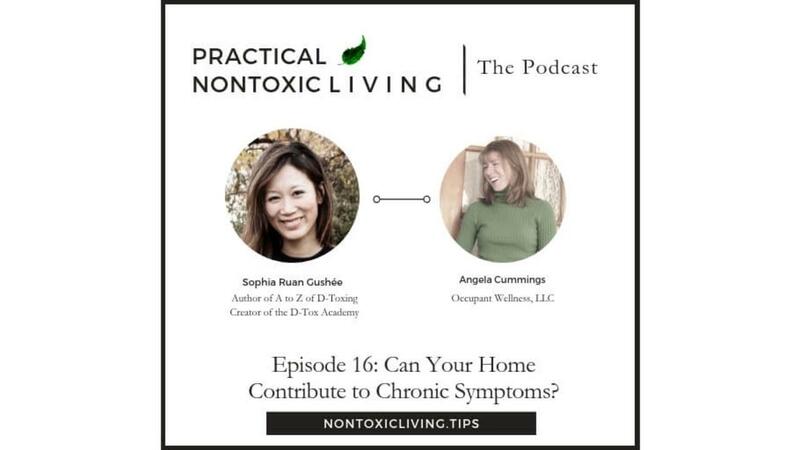 If you or someone you know have unexplained chronic symptoms, then maybe something you hear in this podcast might inspire you to consider the health of your home. You'll hear how Angela tracked her and her son's pattern of symptoms to discover which home exposures were making them sick. And, please keep in mind a new online program I'm launching in April 2019 called Home Detox 101. It lays out easy ways you can detox your body burden by choosing simple tips to detox your indoor air, drinking water, sleep, house dust, and more. Through short videos and a menu of options, this is meant to welcome you onto a pleasant path of detoxing your home for healing spaces. For now, check out my conversation with Angela. By the way, this was recorded years ago. Since then, Angela has helped me with articles about detoxing our homes. You can find these free resources—along with the transcript to this podcast—at NontoxicLiving.tips. And please visit Angela's website Occupant Wellness through which she helps people live healthier, more comfortable lifestyles. Angela Cummings: My son and I, back in 2000, had purchased a home that was only five years old. And when we moved into the home we started experiencing a lot of sinus infections and ear infections, things that were becoming so consistent that we were at the doctor’s office all of the time and where we literally ended up on antibiotics for about 46 weeks out of the year, so about 88% of the time. Something was clearly not right. Then the rest of our life was really pretty healthy, like we ate healthy, we exercise, we were very social with friends and family, we were involved in church, so the typical things that you'd start with or look for to change in terms of medical illnesses we were already doing. So we had gone to, between my son and I, 11 doctors over a period of eight years. The doctors were really just kind of stumped. But honestly, it ended up being one of the best things ever because, really, it made me take control of my own health and really forced me to figure out what was going because, of course, nobody wants to feel sick all the time. Nobody says, “Ooh, I wish I'd have a sinus infection and ear infection and feel miserable and have to push through.” Nobody just likes to feel that way. Sophia Ruan Gushée: No, definitely not. But I’m curious. Before the doctors said to you, “We don’t know. We’re out of ideas. You need to figure this out on your own,” had you already started to figure things out on your own or did you just keep thinking you needed to find the right doctors? Angela: I was understanding that I was having symptoms of something. So there was, in addition to the infections that we were getting, sinus and ear infections, I would recognize that when I would walk on the carpeting with no socks on, my feet were itchy. So we ended up replacing our carpeting with a laminate wood floor thinking that that would solve the problem, because carpeting holds a lot of debris and dust and things like that, so thinking that would solve the problem. I actually experienced a different problem. When we put in the laminate wood floors that were made of composite wood, I would get out of bed in the morning and when my feet hit the floor they would actually start swelling. So there were instances of things like that that was happening. I recognized when - we had a natural-burning fireplace - when I'd have a fire in the fireplace and I curl up with a good book on the couch at night, the next morning, I would wake up and feel like I was hit by a bus, like I was very swollen and very tired. It was hard to get out of bed the next day. So I started putting together patterns of things that had been happening just kind of in our day-to-day life or even if we did projects. Like if we painted the wall or I actually stenciled a piece of artwork on our wall, I wouldn’t feel well after I did those things. But, like most people, I think I just dismissed them as well. It’s something but I don't really know what it is and so you just move on and don’t really put two and two together. So I had a lot of symptoms, I just didn’t understand what the cause of the problem was. It was beyond my comprehension at that time. Sophia Ruan Gushée: Also apparently beyond the comprehension of your doctors too, because no one really asked about your home environment. Is that right? Angela: They asked but it was more about the carpeting. For example, we had an allergist that said clearly me and my son were both allergic to dust and dust mites which is so incredibly common. They were the ones that actually suggested, “So you should tear up the carpets and that will solve it.” “Make sure you clean your house once a week and you'll be good.” While that wasn’t what would happen. So they had limited knowledge too and it was sort of a basic, what I would consider now knowing what I know now, I would consider the basic steps of not related to actually chemicals and everyday products but just the limited information that they had at the time. Sophia Ruan Gushée: So your doctors told you, “We don’t have any other ideas,” what did you then do? Angela: Well, at that point I pulled all of our medical records. I pulled our medical records from any healthcare organization we had gone to. I pulled our pharmacy records so I could see all the medications that we had been on, and I took this rather large stack. It was about a 4-inch stack of paperwork between my son and myself. I made two different Excel spreadsheets, one with my son’s information, one with my information, and I just put all of the data that I could into there. What were the instances of infections? What was the antibiotic that was prescribed? How long was it prescribed for? So I recently immediately put everything into Excel spreadsheets then I analyzed the data. It was interesting because, as I was looking at the data, I could very clearly see that we had gone from a couple of instances of sinus infections to 10 to 12 per year and then on antibiotics for spans of three weeks at a time, whereas originally it was only a week or so. So you get to see the pattern of increase in both the infections and the amount and length of time that we were on the antibiotics. So I reflected back and we had an opportunity in life to help out a friend of mine who had gone to high school with. We’re very good friends. He had helped me through two very emotional, difficult times in my life and we had kept in touch after high school. He had come over one day and sort of showed up on my doorstep and said that he and his wife were getting divorced. He worked a third-shift job and so he didn’t have anyone. As you can imagine, it’s very difficult to find babysitters on third shift. And he didn’t really want to give up the time with his kids. So I had told him that until he found a longer-term solution that I would be happy to help. It’s just my son and I. We can easily pack a bag of clothes and he lived very close so we could just head over there. So we ended up doing that. Our short term sort of turned into a year-and-a-half long commitment that we ended up helping him out. And during that time frame was the exact time frame that our sinus infections and ear infections dropped to like zero. Then when we stopped that arrangement, you could see the instances of infection returning again. So at the time I was looking at this, it was a couple of months after we started helping him out with watching the kids overnight, it was interesting to me in two ways. It’s not only to see it in black and white, which was very powerful, but then also to realize that I didn’t really even realize what was going on at the time. I knew we were feeling better but didn’t, so it was really interesting. Sophia Ruan Gushée: Well, these exposures are invisible so it’s so hard to be aware of how your indoor environment from the materials that make up your home and your things, how that can affect your health. It’s not commonly talked about so it’s also taken me a long time to realize the potential effects that our homes can have on our health. I’m so glad you're sharing this story because, for other people who suffer from chronic symptoms, this might get them more curious about whether it could be their home as well. So once you started to realize that your home was making you sick, then what happened? Angela: Then at that point I tried to do really anything that I could to stay in our home. We lived in this small neighborhood and we had very, very close friends that were our neighbors. Our neighbors became our close friends. So to me the thought of moving was very upsetting. It was very sad. We really, honestly, I drained our savings account trying to stay in our home. I had an indoor air quality specialist come in thinking, “Well, okay, maybe there's something that I can’t see, something behind the walls.” So they conducted mold tests and indoor air quality tests. At that time, an indoor air, or at least the company that I had gone with, they didn’t test for chemicals. They tested for more of the standard things that indoor air quality testing allowed for at that time. Sophia Ruan Gushée: Like molds and lead. Angela: Yes, exactly. So they did the test, and there's mold in every home, but the levels that came back in the tests were low. And the basement came back on the high side of low, so still within the low category. So I had a very small amount of mold remediated. At the same time, I had the insulation removed out of the steel plates. They cleaned all that up and then I had spray foam put in, because that was one of the things that was suggested by one of our allergists that might be a good thing. It seals out all of the air and they're supposed to be this very airtight, energy efficient and good for people they thought at that moment. We went ahead and did that. We tore up carpeting in a couple more rooms, put in the laminate flooring. So I really tried to do, at that time, what I thought was the right thing to do to improve our home. Unfortunately, I ended up making it worse. But, again, I didn’t know that at that time. Sophia Ruan Gushée: I so feel for you. I’m so sorry you went through that, I mean to work so hard to create a healthier home and then feel more sick. I really feel for you. Angela: At the end of all of that, I made the difficult decision that we really needed to sell the home. So we did that. We ended up we put the house up for sale, we moved back in with my parents. That was in my mid-30s at this point, so it’s my son and I. I’m so incredibly grateful that I had a place to go that was far safer. My son and I both felt much better in their home and, again, didn’t have a lot of sinus infections and things during the time that we stayed with them. So I ended up selling the home and stayed with them. Then my next step was to figure out what in the world really happened there and how do I not get into this situation again. So while I was trying to figure it out, and really, by figuring it out, I was trying to search for anything that I could remember was symptoms. Like I had mentioned, walking in laminate flooring, swollen feet. Because I didn’t have a name for this. I didn’t know what to call it. I don't know what was happening. I started kind of searching these things and, ironically, while I was doing that, I had just purchased a new ottoman. So I was sitting on the ottoman, sitting at the computer and I started to not feel good. So I had gotten up. I thought, “Oh, I may be hungry,” whatever. So I went and got a snack and grabbed some water from downstairs. That’s a two-level, two-story house. From downstairs, came back upstairs, jumped back on the computer and was feeling fine. Jumped back on the computer, started searching again, and just felt crummy again. So I go ahead and I turn it over. I looked at the tag and I have no idea what the word was. So I punched it in to Google. Thank goodness for Google. I punched it in to Google and it came up that basically the ottoman was made of vinyl and foam. Then I searched ‘vinyl and foam’ and the symptoms that I was having and slowly, like things started popping up on the internet, started talking about how the chemicals in these products are creating health problems and they're making people feel sick and causing just short- and long-term illnesses. So that ended up opening the door to a whole slew of information. I finally started, of course when you read articles or learn something new, you learn new language. So some of the terms that were in the articles or resources or websites that I was reading I could punch in then and then found more and more and more information. That really led me to the path of, first of all, discovering what in the world even happened in our house and then, secondly, I ended up being able to put a name to this illness that I have, these constant sinus infections and what was causing it, and the symptoms that I had at that moment, which was multiple chemical sensitivity. Really, one thing leading to the other helped me actually in a really large way. Sophia Ruan Gushée: So what did you learn about multiple chemical sensitivity disorder? Angela: What I learned about that is a couple of key things. One is that it was caused by chemicals in everyday products. So not only the ottoman I was sitting on, not only the laminate flooring we had just installed and the paint that we used and the foam that we had just sprayed into our then old house but also in our everyday products, so in our shampoos and conditioners and our body soaps and in our food and our clothing. Just kind of in every single thing that we end up touching potentially has these chemicals that are harming us. Sophia Ruan Gushée: Yeah, very _____ [unintelligible 18:38]. How common is multiple chemical sensitivity disorder? Angela: At that time, it wasn’t very common at all. In fact, a lot of organizations, like major organizations, didn’t even recognize it very much as a medical condition. Now, fast forward to 2017, there are actually three different categories of multiple chemical sensitivity. One is being sensitive to fragrances. Maybe someone has perfume or cologne on and you kind of go, “Yech”. Not that it smells bad but just it doesn’t make you feel good. Then all the way up to having a chemical sensitivity where your immune system is very sensitive to anything with chemicals in. At that level, it’s actually recognized as a disability under the American Disabilities Act, so it can be very limiting in terms of life. So many people, if you think of a work environment and all the chemicals that might be in there, so there are chemicals in computers and people that wear perfumes or scented products. Maybe they wash their clothes in fragrance laundry detergents or have got hairspray in or… there are just so many things so it becomes very difficult to be in that type of environment working. And so many times, at that level, people will actually not be able to work at all in some cases and sort of lose everything. At that point, of course, if you don’t have income coming in then it’s difficult to keep your car and your home and you become socially withdrawn because, again, if you're out in public and people are wearing tons of sunscreen or fragrances or body spray, that also becomes very difficult. At this point in 2017, it’s far more recognized and acceptable. As far as percentage of the population that has the most severe case, I want to say the last statistic I saw was 5% of the population. But if you look at all four categories, anything from people that have fragrances that bother them all the way up to that highest level of multiple chemical sensitivity, I believe the percentage, the last percentage I saw I believe was in the high 40s percent. I want to say like 46% or so. Sophia Ruan Gushée: Wow. I had no idea. As I listened to you, I was thinking I bet there are a lot of people who are sensitive who don’t even know that they're sensitive to chemicals. Angela: I would agree with you. Honestly, even with my own experience several years ago where I was, again, stepping on the laminate wood floor and my feet swelling, that was a chemical sensitivity that I had no idea what it was. I just had no idea. I would imagine there are many other people out there in a variety of ways are experiencing this and don’t even know it. I completely agree. Sophia Ruan Gushée: My personal experience, one that stands out is fragrance. I grew up loving all these wonderfully scented lotions and shampoos and perfumes. When you grow up immersed in fragrance and there is never a problem or anything, any chronic symptoms I had the last thing I associated it with was fragrance. Then after I had my first child and I started to learn about the concerns about fragrance and how they can cause hormone disruption in not just me but also my children, I cut out fragrance as much as I could from our lives and I felt much better. So chronic symptoms that I had lived with I didn’t even realize I had chronic symptoms until my body had a break from all the fragrance and then I just felt better. 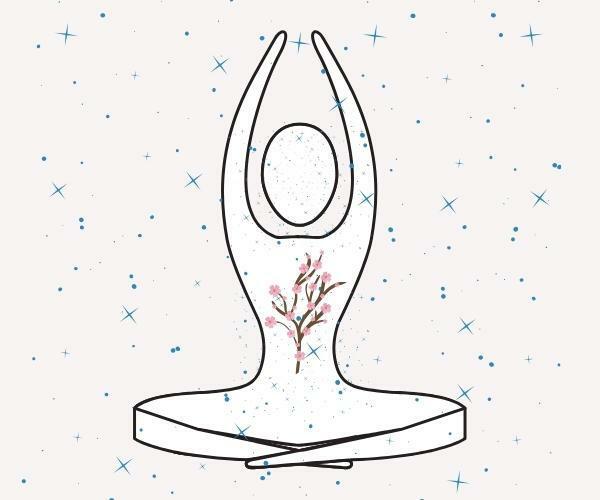 Then when I would encounter fragrance at work or with friends or in a restaurant or store, the worst is going into a place where there's a burning candle with fragrance, or the airplane or cleaning products or in hotels, then I would notice my body’s reaction. So only with these experiences of taking breaks and then re-encountering the fragrance and later on I learn of other exposures, only with these vacations and re-encounters would I realize the effect they had on my body. So I think for many people, especially if there are things in their home that their bodies are reacting to, they live it day in and day out. They’re not even aware that maybe their bodies are sensitive. Angela: I agree with you. I think you have a great point. And I think our bodies are amazing. They adjust so well to so many things. They're here to protect us to make sure that we survive. So I think that when people are exposed to these things, like you said, it becomes their norm. The body adjusts and it can only adjust to a point, of course. Any of our bodies can adjust to a point. But if you think like a bucket of water or just an empty bucket, each of us has an empty bucket of things that we can tolerate. All of our buckets are different sizes. Maybe some are small or some are larger. Maybe they are larger and become dented and so they become smaller or different in shape, but we all have this bucket. And as chemicals and other things in life fill up this bucket, at a certain point it starts to overflow. But you don’t really realize how full your bucket is until, number one, it’s overflowing or, number two, like you stated, that bucket has a chance to sort of empty. Then once it starts filling back up you go, “Oh, yeah. I do notice this difference.” So I think that’s an excellent point. Sophia Ruan Gushée: Have you found effective ways to… like what has helped you empty your bucket? Angela: One of the most significant things that we did was to get into a home environment that had little to no chemicals in it. When I say that I mean in the materials and in the processes that we use to actually put it together. I mentioned I have been living with my parents and lived with them for a while until I could really get this figured out enough that I felt comfortable purchasing another home, so I was kind of between purchasing and building. But I ended up purchasing a home that was built in the 1960s and then remodeling. The materials that we used to remodel were products that had little to no chemicals in them. For example, like ceramic flooring, which of course you have to look out for lead so you just have to make sure that you're not having that poison in it either. But so ceramic flooring. We were fortunate enough to find a house that had excellent hardwood floors that were original. The finishes on the floors we paid attention to. Those were chosen carefully, the paint on the wall. So just kind of every detail and then how things were installed. So when we had to replace a couple of planks of the wood flooring, the installers used in nails instead of toxic adhesives, things like that. So we really created, took a lot of time and energy to make sure that we created an environment that we could go home to and really recover. When you talk about emptying the bucket, it’s all about… well, first of all, not putting things into that bucket, but then, secondly, how do you empty that bucket like you had said. A healthy home environment is one of the most impactful ways to be able to do that because you can’t really control what’s happening out in the world. You can’t control your work environment, that somebody comes in with 10 pounds of hairspray on that’s super smelly one day. But when you come home, you can at least relax and be in that healthy environment where there's not chemicals being added to your system so it allows your body to actually work through all those chemicals, process it through your body and get them out. That’s one of the significant things. Then over time, we ended up also changing everything from our food that we ate to the clothing that we buy to our cookware in our kitchen and eliminating a lot of plastics in our home. Really, I've tried to take a very comprehensive approach but, like I mentioned, it was so overwhelming at first. Of course we all have limited time and limited budget so it’s not like you can just throw away all of your food and your clothes and everything else that might be in your house and start completely over. Most of us just don’t have that luxury. What I ended up doing was really taking it one step at a time in small steps. Our home was one of the significant things. I put a lot of time and energy into that and that wasn’t so slow. That was kind of a big thing. But as far as our food, even when I first started shopping for more organic items, it required a little bit of knowledge and looking for the right labels and _____ [29:25] and what do that really mean and was that the best thing. So I had a lot of questions floating through my head. So as I even started implementing that and, again, being cognizant of budget at that time as well, I just started buying… my goal was to go to the grocery store and buy one or two things that were organic and that was it. The first time I went, I think about three things that were organic and I called it a win, and it was awesome. The next week that I went I thought, “Well, I want to buy at least straight out I’m going to shoot for four.” And I did. I came home with four things. So each week I took more and more steps to purchasing organic food. Then at a certain point when we were buying most of our staple items organic, I found Thrive Market which you can purchase discounted packaged products. Some of them are organic through Thrive. Sophia Ruan Gushée: We use Thrive too. We buy from Thrive. Angela: I love that _____ [30:31] innovation. It’s wonderful. So once a month I put together an order. If you have a minimum order amount you get free shipping, so it’s an even better bonus. Once a month we put in an order for just the standard things that we eat, organic oatmeal and our spices and things like that. So I just took it one step at a time and started implementing these things. The same thing with our clothing, looking for more organic clothing and so on. I just started really getting rid of the things that were toxic in our lives. Soon, you look back over a period of three months, six months, a year, five years and we aren’t perfect. I’m not going to say that you won’t see one ounce of plastic in our house. We have got maybe a handful of plastic things. But it’s a handful. It’s not cupboards-full like we originally had. And it didn’t kill our budget. It didn’t kill our time. It didn’t shock our lives. We just took it one step at a time. 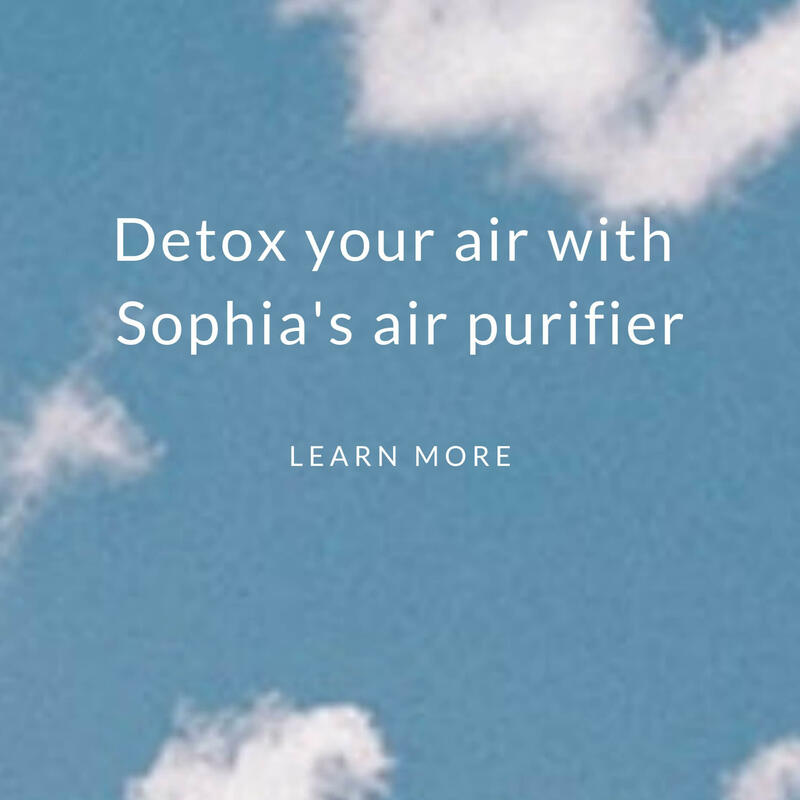 Sophia Ruan Gushée: I just love that you're explaining your experiences as a very manageable example of how to detox over time in a way that’s not overwhelming, that’s not going to bankrupt you. It can be very manageable. Of course, selling your home to build a new one is a drastic thing but you were in a really unique situation. I’m so glad that you and your son feel better now. Do you think that most people who would have to live in your prior home would get sick? Or does it that you and your son got so sick in that home was that maybe because your bucket was more full for some reason? Or do you think that home is particularly toxic because you spoke about spending a year-and-a-half at a friend’s home and spending time in your parents’ home and you felt better in these two different homes? Angela: That’s a good question. Honestly, I wrestled with that before we put the house on the market because I thought, well, I don't want anyone else to experience this. What we actually did, so the two other homes that we had stayed in, my friend’s house and then also my parents’ house, both of them were far older than the house that we were living in. Ours was a 5-year-old house. Their house, like my parents’ was built in the 70s. Then the other home that we were staying in had been built in the very early 80s, late 70s early 80s, and they weren’t remodeled. I think that was another key thing. So they didn’t have fresh carpeting and paint and things like that. I think that was key. It’s recognizing that sometimes our perception of reality and reality are sometimes two different things. Maybe I just wasn’t remembering being sick. She had told me she said, “No, we didn’t get sick in the house at all.” So that was a comfort to me. We also had our neighbors, who I had mentioned we’re very close to, so our neighbors would also spend some time in the house and they didn’t feel sick in the house. That gave me some level of comfort in knowing that not everybody felt the same way that I did or that my son did in homes. Sophia Ruan Gushée: Yeah. These things are not absolutes and everyone has unique vulnerabilities to different things. You've mentioned laminate flooring a few times. By ‘laminate flooring’ do you mean vinyl? Angela: No. With laminate flooring we had put in composite flooring. It’s like kind of a snap-together. It’s not solid wood. It’s more of like a pressed board and then the top of it it looks like wood but it’s laminate. It’s basically pressed wood. Sophia Ruan Gushée: Got it. Okay. It would probably be adhesives and any coatings on the wood that were off-gassing. Well, two questions. One, can you talk more about the symptoms that you and your son had with the intention of anyone who’s listening maybe they're suffering from these symptoms too and they just haven't associated these symptoms with their home indoor environment. Then in hindsight you could talk about what are the key materials that you learned were making you sick. Angela: Sure. As far as symptoms go, some of the common symptoms were like ears hurting, so feeling very achy. Swollen glands was one of the things that was, I remember, really striking me. Where my glands, especially in my neck area on both sides, would swell up and I can really feel them. So that was significant. Feeling dizzy. There were times where I really felt dizzy. Say, if I was laying on the floor or something I would feel really dizzy. Not just like I had rushed getting up because, of course, everybody experiences that, but more just kind of dizzy, a longer-term dizziness. One of the things that was also significant was feeling tired. I felt tired all the time. There were days where I felt exhausted, like that whole sink-into-your-bed exhausted. Again, everybody experiences that if they’ve sort of overdone life. But I wasn’t overdoing life at that time so there wasn’t a logical reason for feeling that way. So that high level exhaustion. Then the swelling that I had mentioned. I noticed that parts of my body were swelling when I would do or touch certain things. It’s primarily these symptoms. Then in retrospect with the building materials, I would say flooring was a significant one, because all of our floors we kept carpet in two of the rooms in the house. All of our rooms were carpeted vinyl. The kitchen and bathroom floors are vinyl. And then laminate wood, which again is that pressed wood, composite wood in three of the other rooms. None of those floors are healthy for people. They're made out of materials that have a lot of chemicals in them. I would highly suspect the paint that was on the walls. Then we freshened the paint a couple of times when we were there so I would say that would be another significant one. The spray foam insulation that we installed, that was a huge one. I can actually remember going into the basement after that foam insulation was sprayed in. It had settled a little bit so we had let it air out for a couple of hours. I had walked into the basement and I remember… well, I should mention we had a pretty clean basement. I would clean the basement floor every couple of months so generally there weren’t a lot of bugs and a lot of dust and stuff like that. So I had walked into the basement a couple of hours after they sprayed that insulation and there were dead bugs everywhere. I don't know where these came from. Sophia Ruan Gushée: Oh, my God. Wow. Angela: Yeah. That should have been an indication to me but, at the time, I went, “Well, okay.” They cleaned them up. We actually had dead bugs in our basement for the rest of the time that we were living there, which was really… then in contrast to our house when we remodeled it, we painted the basement, I did the walls and also installed new insulation, not spray foam insulation. It was a different type. That day, the next day, always since then there have been live bugs in the basement. Honestly I don't like bugs but I'd never been so excited to have live bugs in the basement, like fantastic. Sophia Ruan Gushée: So for anyone listening and they're not making the connection, because I immediately know that spray insulation can off-gas fumes that can affect your nervous system. And I don't know if this is what killed the bugs, but I think of pesticides who kill bugs by affecting the nervous system. So I don't know what killed the bugs but I know it was probably related to the spray foam insulation. Angela: Exactly. I would say that was significant as well. Sophia Ruan Gushée: Yeah. Years ago, my husband and I built a home and so we went through a similar process of trying to create the healthiest home we knew how to do at the time, which is a pretty overwhelming project. There are so many details involved, as you know. At the time, I had not gotten around to researching insulation. So we have spray foam insulation and I noticed that I had been fine. I had felt normal but then after there were some workers in our home, there was one side of the bed where whenever I sat on this one side of the bed to work or read, I would notice my heart rate increasing, I feel a little nauseous and light headed. I just noticed this pattern that if I wasn’t sitting in the bed, if I moved somewhere else the symptoms would go away. Then when I got back into bed, especially at night, I would feel these same symptoms. I didn’t even know what to do with this information, like who am I going to talk to about this. And like months, maybe a year later there was a guy in our home looking at the HVAC system because it wasn’t working. I thought he's going to think I’m crazy but I don't know who else to talk to about this. He had closed the door to the attic and I was blown away that he was even familiar with this association between the insulation and my symptoms. Then I stopped getting sick. Angela: That’s awesome that he could put that together. That’s so helpful. Sophia Ruan Gushée: Probably because I’m not the first one he met who had a version of that experience. Are you mindful at all about electromagnetic fields? Have you noticed sensitivity to them from WiFi routers? Angela: Yes, definitely. My family is big into technology, my extended family, so they have multiple iPads and Apple TV, things like that pull a lot of WiFi signals. They have their WiFi on all the time. I significantly feel worse when I go into their environment and they have all of those devices on. Similarly, in our home, we don’t even turn on the WiFi. We do have WiFi capability in our router but we actually hardwire everything and then we unplug it at night. And I can tell the difference. Like if I keep even our hardwired internet plugged in at night, I would wake up in the morning feeling swollen. You could actually see the swelling around my eyes. And I'll feel far more unrested, like I just didn’t get a good night’s sleep. Whereas if we unplug everything I feel far better. Angela: I think WiFi and other electronic radiation is significantly impacting health. Another thing that they don’t think people really realize or put together, and I think that they don’t… we’re surrounded by WiFi and really at everything. You can buy, of course, the watches with WiFi. Again, I was reading an article, it was a couple of years ago, about tennis rackets that have WiFi so they can track how much your stats and all this kind of thing. Really, these days people don’t really unplug. So getting back to one of your comments earlier where you don’t really realize things sometimes until you step out of them and then come back and sort of reintroduce them and you can see the difference that it makes in your body. That was definitely the situation for me. That answers as well with WiFi and other electronic devices. Once you step away from it, you realize how much it actually is impacting your body. Sophia Ruan Gushée: Electromagnetic fields which are created from things like WiFi or your cell phone, it’s another area or type of exposure that I didn’t realize I was sensitive to until I started giving my body breaks. For me, it’s more important that at night when we sleep that everything is shut off that can be shut off. But by just decreasing my family’s exposures in general, I’m just much more sensitive to it now when I’m around it. And other people in my life who have listened to me talk about this and who also now turn their phone to airplane mode at night and take other precautions, they say, “I really think I’m so sensitive now to when I’m around it.” Because you just notice the change when your new normal becomes less burdensome on your body. I've really, really enjoyed talking to you. Unfortunately, I have to go to a doctor’s appointment soon. I just have a few questions I’m just curious, sort of mom-to-mom. Do you think plants… I know some plants can really improve indoor air quality and convert toxic chemicals like formaldehyde into oxygen. Do you find, from your experience, do plants help you? I know that the studies say you need a lot of plants in a given space. Do you incorporate plants into your home? Angela: I don't. The reason that I don’t is I have a mold allergy where I’m pretty sensitive to molds. I had read similar things, though, to what you're saying and this was a few years ago. When I had asked my allergist about that, they suggested that I didn’t only because the mold content in the soil would be too high to be beneficial to me personally. So I would be trading a benefit for then that would be harmful to my body because of my allergy to mold. 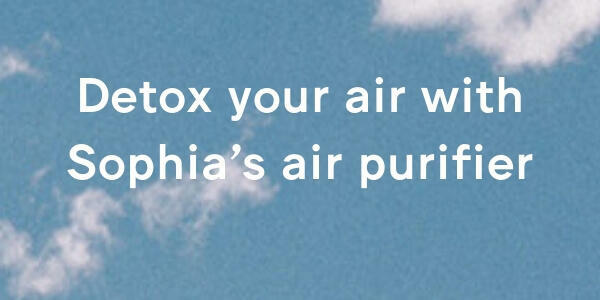 Sophia Ruan Gushée: Do you find air purifiers help you? Angela: Yes. Yes, absolutely. I have an Austin Air purifier. It’s a HealthMate Junior Plus. Even that experience was interesting because I had purchased the larger… Austin Air makes several different sizes and several different types of air filters and so I had purchased the larger version of the HealthMate Plus. It was too meaty for me. It had actually too much carbon in it and so it ended up having… like while it was purifying the air beautifully, it actually was just putting too much carbon back into the air, which the Austin Air folks actually helped me figure out, which was phenomenal. It was very exciting. So when I had gotten the Junior version, we actually have a couple of them in the house, one in the basement and one upstairs outside of our bedroom that’s purifying the air. If I turn them off or turn them off and forget to turn them back on at night, I definitely noticed a difference. Sophia Ruan Gushée: Interesting. I’m glad you use Austin Air. That’s what I use too. And I've always wondered is that the best one for me to use? Also, I’m wondering do you open your windows? Because I know I appreciate the theory that if you leave your windows open, it allows trapped indoor air contaminants to flow out and to let your home breathe. But in reality, if you have allergies, that’s kind of a tricky bit of advice. Angela: Yes, it is. I've gone back and forth on this because of that. What I'll do is usually I'll open my windows in the winter. Occasionally, I'll do it in spring or summer but it’s not very often. The reason that I choose winter is that most things outside are dead. The mold count is typically low, the pollen count is typically low so I'll open the windows then. But I agree that there is an importance to having fresh air in the homes. So when I do open the windows, like in the spring or summer, what I'll do is I'll open the windows, let’s say on Friday then Saturday I'll clean our house. I try to at least open them at a time or even Friday afternoon. Like if I open them in the morning, Friday afternoon maybe I'll clean the house. So I try to do it at a time where I’m letting the fresh air in but I’m letting the pollen and everything settle and then cleaning it up right away. That actually works pretty well. Sophia Ruan Gushée: That makes sense. How do you clean your home? Angela: Really going back to basics. Like we have cotton rags. Some of our rags are actually even socks with holes in, kind of thing, or old dishcloths that have been used for years and now are a little too tattered to have out in the public eye. We actually use cotton cloths and we use our dish soap, a couple of drops of dish soap put it in a big bucket of water. Then for disinfecting we use vinegar and sometimes hydrogen peroxide too, like when I’m cleaning especially the sinks. Like the kitchen sink I'll put hydrogen peroxide, let it bubble up then just clean it with soap and water. That usually does a pretty good job of getting everything out. And if we needed to scour, we’ll do baking soda and water. Sophia Ruan Gushée: That’s how I clean my home too. Do you have a good, effective, non-toxic way to deal with ants? Angela: Ants, we use cornstarch. Sophia Ruan Gushée: So you sprinkle it in areas where you would generally find ants? Angela: Yes. That’s it exactly. We had ants coming in our kitchen and we did that. Then I also have a mix, like cornstarch with just a little bit of something like sugar grain or crackers that I crush up just because then it attracts the ants. The food attracts the ants but then they actually take the cornmeal as well. Is it meal or starch? Now I’m second guessing. It’s either cornmeal or cornstarch. I apologize. It’s in my refrigerator. But what the ants do is they actually take it then back into the nest with them and share it with all the ants. Within a year, like we had ants last year and this year we've seen like two in our house the entire season which wasn’t happening last year. Sophia Ruan Gushée: Interesting. I do remember reading about that a while ago. I've been experimenting with different solutions. Lately, I think what’s been working is vinegar and lemon oil. It’s great to be reminded of cornstarch. And lastly, really, I would just love to talk to you further but I have to go soon. But I just wanted to ask you about what you do professionally. Because I know you have a company Occupant Wellness. I just want to let more people learn more about what you do. Angela: Yeah, I do. I did start my company Occupant Wellness a few years ago. Really, because of my personal experiences, I really wanted to help other people understand that chemicals are in our everyday products and they are creating these illnesses, whether it’s short term and long term or, like you had pointed out in your book, A to Z of D-Toxing, short term turning into long term that it’s so important that people know and understand that. And then that they have two things. One thing is information sources to not only learn about these products and the chemicals in our everyday products and how they're affecting health but also, and equally as important, or maybe more important, like what do they do about it without it being overwhelming. So I did start the company a few years ago and I did that while working full time and taking care of our son and our house, things that everybody out there does all the time. I started juggling both of them so that’s been really exciting and really, I think, important to help other people. So I have my company then at the same time I also do some consulting for other companies, more kind of on a project basis, generally speaking, putting together. I used to be a grant writer in my former life for federal and state and local grants, so I love to write. That’s one of the things. That’s sort of also helped with Occupant Wellness, just putting content and helping people to understand things that I didn’t understand five years ago. Sophia Ruan Gushée: That’s great. So how can people reach out to you or learn more about you and what you do? Angela: I have a website https://www.occupantwellness.com and that describes… I’m actually in the process of writing a book. I had started back in January. Angela: Yeah, I’m very excited. Sophia Ruan Gushée: Are you sharing what’s it about or you're keeping that under wraps? Angela: No, I can share what it’s about. The title of it is Less Chemicals, Happier Life. Some books go into great detail, like A to Z of D-Toxing goes into great detail about all the studies that are out there and it is an awesome tool for connecting to different resources and really giving a good understanding of what is in our everyday products. And it’s a comprehensive thinking-through of is government protecting us? Are these third parties protecting us? Like who is out there protecting us? Who’s giving us this information? Is it credible or not credible? So walking through that. The book that I’m writing more points to those resources as those resources that do an excellent job of that, but then also it’s more focused on what are the day-to-day steps that you can take to easily incorporate this in your life. I know you addressed that in A to Z of D-Toxing as well where you have your own charts and tips which are awesome. Sophia Ruan Gushée: That sounds great and so helpful.